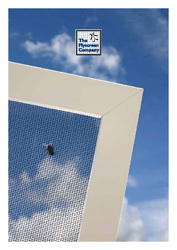 We supply a large variety of insect mesh for cladding and screening. This product is used in new build & retospectively fitted housing development projects among having a huge calling in other areas too. By using mesh on houses it reduces the chance of insects entering properties through eaves and soffits. This will be used alot more as people plan for the future of housing as a result of global warming. We can supply full testing certification for our products.